Disclosure: The Christmas cards featured in this post were provided by Minted. All opinions, images and love of pretty Christmas cards are 100% mine. This time of year is crazy, yes? I’m always on the lookout for ways to save time, but especially so during the holidays. There’s just always a never-ending to-do list during December. I’ve come up with a few ways to save time during the holidays and figured I’d pass along the time-saving goodness to you guys. We got our cards from Minted again this year. I love their gorgeous designs and always have a hard time narrowing it down to pick just one. Plus I like that all of their card designs are by independent artists. One of my absolute favorite things about using Minted is they offer FREE recipient envelope addressing. As in, you just type in your list of addresses (or if you used them last year, they’re already in there minus any updates for new friends or people who moved), and your Christmas cards magically show up at your door all addressed! No more hand cramps! It’s one of the major selling points for me. Minted offers stamped envelopes, too to save you even more time. Our cards are the Brushes card, with the Berry with Gold Foil color. (The other color options are Candy with Rose Gold Foil and Pine with Silver Foil.) I’m loving all the pretty foil options this year. You can see all of the gold foil pressed options from Minted here. And speaking of saving time, I also love that you can use Minted’s Find it Fast option, which plugs your photo into all of the cards displayed on the page so you can quickly get an idea of what the cards look like with your picture. Told you they have so many pretty design options! 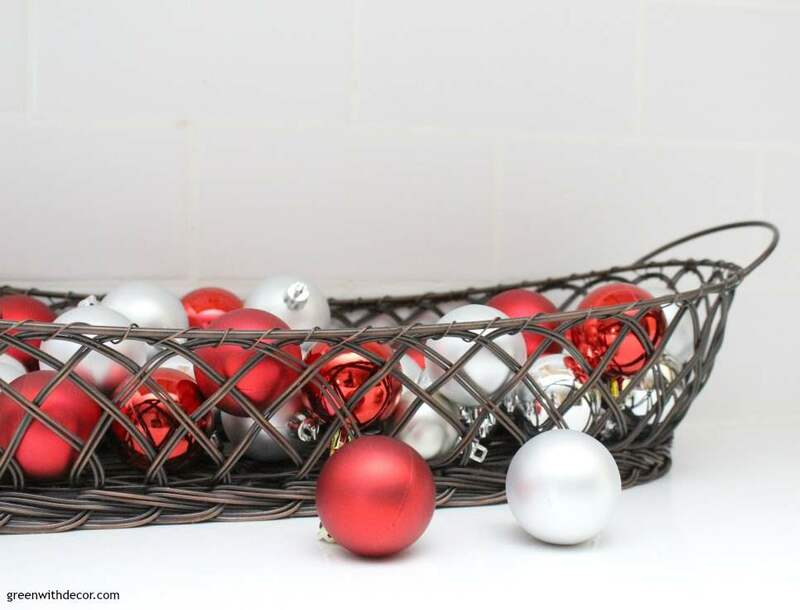 This post on easy Christmas decorating ideas for the kitchen and bathroom is one of my most popular posts – probably because easy decorating is the best. I love seeing all of the elaborately decorated homes on Pinterest, but sometimes, we just don’t have time for that! Tossing ornaments in a basket or using a scarf as a tree skirt makes a kitchen feel festive in about 5 minutes! There are also plenty of everyday decor pieces that easily double as Christmas decor, meaning you don’t have to waste time putting stuff away only to bring it back out a month or two later. This might be totally obvious, but it’s worth saying. Online shopping saves so much time! And with so many stores offering free shipping (either no matter what or when you hit a certain dollar amount), shopping from the comfort of your couch is totally worth it. Aside from any local stores I bought gifts at, we did all of our shopping online this year, and I’m loving it. If you’re stumped on gift ideas for anyone on your list, you can see all of my gift ideas here. I have lists for people who love traveling, entertaining, wine, drinking, new homeowners, quite a few lists for home decor lovers and more! I made a little gift spreadsheet for the first time this year, and I can’t believe I didn’t do it sooner. Make a spreadsheet that lists each person you buy gifts for, with each gift (and amount spent) underneath each name. It’s a quick way to keep track of how much you’ve spent on each person/see when you’re done shopping for someone. I also put in an ‘arrived’ column so I could check off gifts as they showed up on the front porch. No more scrolling through all of my ‘order confirmation’ emails to make sure everything I ordered had arrived. I saved the list to my Google Drive so I could easily access it from my phone or computer. I’ve mentioned this before when talking about our St. Patrick’s Day party, but it works any time of the year (even a random Friday night). If you’re hosting anything from a neighborhood holiday party to Christmas dinner, split up the food list! Have everyone bring an appetizer or Christmas cookies, and you’ll instantly feel less stressed about all the food prep in your future! Do you have any other tips for saving time (and hand cramps) this holiday season?